Grand Cayman, Cayman Islands, April 10, 2019. The Caribbean Regional Fisheries Mechanism (CRFM) and CCRIF SPC have signed a Memorandum of Understanding to develop climate-resilient fisheries and aquaculture industries in the region. The purpose of the MOU is to formalize collaboration around the Caribbean Oceans and Aquaculture Sustainability Facility (COAST) initiative, which will help to reduce the risk that climate change poses to food security and nutrition and to mitigate climate change impacts on sustainable food production as it relates to the fisheries sector. Grand Cayman, Cayman Islands, January 7, 2019. CCRIF SPC is pleased to announce that the Government of Panama has joined the Facility and has purchased parametric insurance cover for excess rainfall. Panama joined the Facility as a late entrant this policy year which began on June 1, 2018. 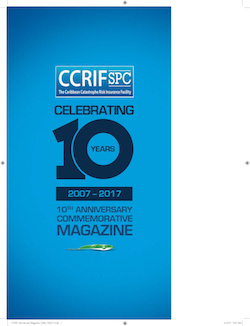 CCRIF’s membership now stands at 21 countries – 19 Caribbean governments and 2 Central American governments. CCRIF welcomed four new countries to the Facility this policy year - British Virgin Islands, Montserrat, St.